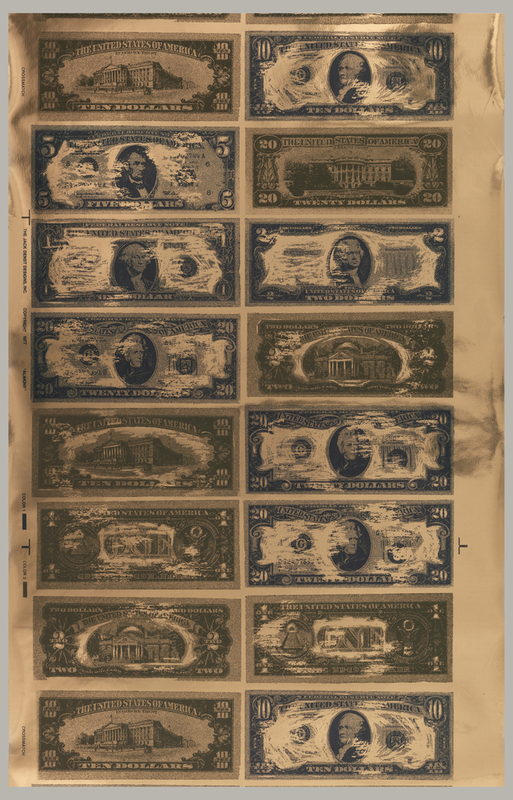 For all you big spenders out there, money might not grow on trees but there was a time when you could head over to your local wallpaper store and purchase some large bills. Humorously titled Alimony this design is composed of over scaled United States currency in denominations of one, two, five, ten, and twenty dollar bills. The bills showing the fronts are printed in black, while the backs are printed in a deep green. This rather dense assemblage of bills is printed on a bronze Mylar foil ground so it is quite slick, and very reflective. Jack Denst and his wallpaper studio were quite Avant garde in their designs. Denst is quoted as saying he needs to stay five years ahead of the consumer, which is three years ahead of the interior designer. (1) The quality of Denst papers was quite high while the hand screen printing was excellent. Many of the designs contain large-scale patterns and the studio was not afraid of bold colors and unusual color combinations. The firm was founded as Denst & Soderlund in 1948 by former veterans Don Soderlund and Jack Denst. In 1962 the firm became Denst & Miles, Inc. By 1966 Denst had decided to go solo and the firm became Jack Denst Designs, Inc., and the studio continued creating new designs until around 1980. Denst was quite a prolific designer. I don’t have a count on the number of patterns he created but there are around 100 different designs in the Cooper Hewitt collection, which includes repeating wallpaper patterns and mural designs.